I am deeply jealous of The Verge today. They got an anonymous email with the product render at right. According to their source, that's the new Kindle Fire. Th screen size for the product wasn't mentioned, but there's supposed to be a 7" and 10" KFs in the works. If you look closely you'll see a hint of a camera and it's pretty clear that this tablet has a screen geometry of 4:3, not the 16:9 screen on the recently retired first gen Kindle Fire. This is an awfully generic looking device, and right now my gut says that it is a fake. I don't like the menu bar on the right side of the screen or size of the keyboard. Or rather I don't find them plausible. Absent a real photo or more product renders, I'm calling out this one out as fake. Update: The Verge posted another couple product renders, and I'm calling them out as fake. First, the qualkity of the images is rather low; Amazon has usually produced better renders than that. There now appears to be 2 KF coming with approximately the same screen size and I just don't believe it. And the third image shows a third model with an unknown screen size and a weirdly shaped bezel surrounding the screen. Sorry, but that bezel plus the multiple models just screams fake to me. Bought Agency Priced E-Books? $69 Million Settlement Pay-Out Is on the Way! The Verge post words it in absolute terms; that it is the new Kindle, rather than maybe. That of course doesn’t mean they weren’t duped. I don’t like the idea of a fixed menu bar, because when you turn the device to landscape you want the menu to be at the bottom of the screen. The Archos 70 tablet had a fixed menu bar. Of course the advantage of more recent Android OSs is the rotating menu bar, no? As far as keyboard goes, isn’t that a stock Android keyboard. Does the original Fire have a custom one? That’s not the stock KB on either my KF or the Android 2.3 tablet currently in my hand, no. And it simply doesn’t look right. That’s a virtual menu bar. My Samsung has that kind of thing on the bezel, hardwired in, dark until you want to see them. But this can be changed when you move to portrait mode. I’d be surprised if The Verge could be so easily duped, so I tend to think it’s real. It’s odd to see a leaked pic though. Frankly, that ‘/’ is something i like right up front (and it’s been on the KF) but it’s generic otherwise. No numbers as alt- or anything. Hmmm. Of course a 4:3 aspect ratio would coincide with your post the other day, but 1024×768 would certainly disappoint the masses. There was definite word that developers were told to program for 1280 pixels long side. I haven’t liked the idea of 4:3 on this as I really enjoy the wide-screened movies on the longer original 7″ Kindle. I would keep it just for that, since all the rumors have been that this is 4:3 like the iPad, which gives you letterboxing then, and for any 7″ device that’s not an attractive thought. I’m hoping all the rumros are wrong. With the additional renders, it looks like a typical 1280×800 7″ tablet. How boring. Next! Anyone else notice that only the horizontally oriented models have a front facing camera, but the portrait-oriented versions do not? Are these two alternate versions of the same model, or just a bad fake job? They appear to be about the same size, although the model in the back is slightly smaller. And, yeah, the bezel on the third image is just unbelievable. I’ve lightened and enlarged the image and described a few problems with the combo-image of the two Kindle Fires, one vertical, one horizontal and I uploaded the brighter and larger image (pixels have very abnormal artifacts, even taking into account heavy jpg compression, where the Skype image meets top and bottom bezel sections). A few other things seem odd with it. It could be editing for sending and publication but who knows. It’s all very curious. Add that the faces are recognizable in the Skype example. The 2nd image of a Kindle Fire is of the long form we see with the current KFire, moreover, (while the first KFire image was 4:3 aspect ratio) and yes, only the landscape images show the webcam lens although the Verge logo might be obscuring it on one long edge. 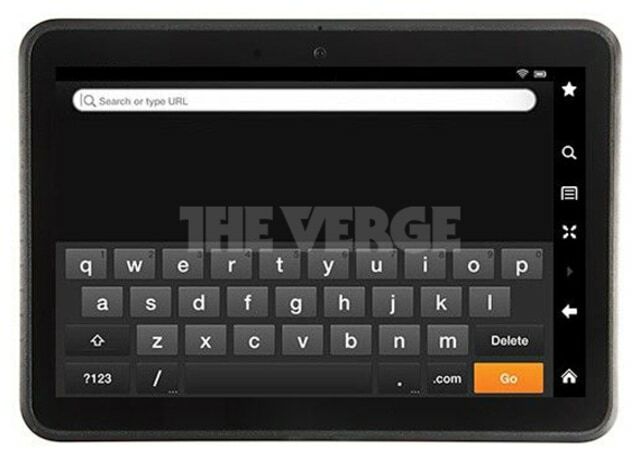 The Verge’s Ziegler said that they were told by someone writing them that the first new Kindle Fire image was not of the Kindle Fire the person had handled. But Ziegler says they know it “originated” from Amazon and maybe it’s one of the other KFires. I forgot to add the URL for my musings on the images. CNet is saying it’s two 7″ models. Apparently lower-end one won’t have a cam. And they probably look different in terms of bezel. This is all dull to me. I’d perk up if someone ports Open webOS to one. Otherwise, not interested in these just as I wasn’t interested in the original. I see your all jacked on Open webOS, so why the falling out with Android? Can’t webOS be in violation of Apple’s patents as well making it just as undesirable? I’m not anti-Android. I just find the Fire tablets dull. Maybe the new one will have something to excite me, but I doubt it. Nexus 7 is best cheap tablet right now (if you can get one built properly, ha!). I asked the FOSS blogger who’s been covering the trials. He thinks webOS is too small for Apple to go after right now. Anyway, we don’t know what patents HP has that they could use against Apple, should Apple apply lawyers. I am not excited about Amazons tablets either because I want a regular Android OS experience. However, I could get excited with the right combination of features and price, though I would be more likely to buy a $99 refurb 1st gen Kindle Fire, if they get that low. As for their e-ink readers, I am epub guy, and it is doubtful any offering of Amazon.com could entice me, especially because I like Sony’s selection of included dictionaries.